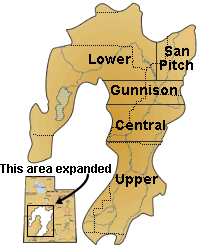 Regions of the Sevier River Basin. 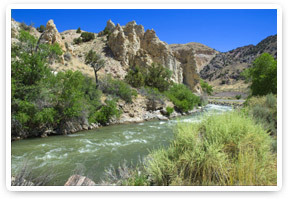 This site is sponsored by the Sevier River Water Users Association in central Utah. The Sevier River Basin is instrumented with solar powered weather, canal, reservoir, pond and river monitoring stations. The tools on this website give users of water in the Sevier River Basin immediate access to data from these sites. Better and timely information leads to better water management. Twelve Mile Canyon Water Quality Study – Millions of dollars in damage caused by annual mud slides in 12 Mile Canyon have Gunnison and Mayfield Irrigation Companies seeking input through data collection, evaluation, and analysis for a solution.